About – Kirsch Millwork Builders Supply Inc. Founded in 1957 as Lakeside Lumber Company, our family business can provide you with over a century of knowledge. Our founders Leo Korzenecki (1901-1979) and son-in-law Edward Kirsch (1929-1980) began by establishing a full service yard that offered trusses, plywood and millwork to Chicago builders. From an early age, I worked in the yard sweeping sawdust and went on to establish Kirsch Millwork with my parents in 1977. 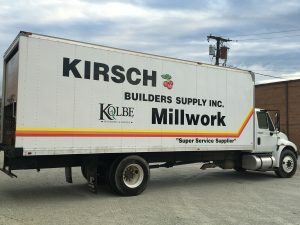 With the help of my mother, Lani Kirsch (1934-2007), I used my business and accounting degree to help grow Kirsch Millwork to what it is today. If you’re in search of windows, doors, mouldings, locks, hardware, and other specialty items for a new home or commercial project, you’ve come to the right place. Designers, architects, builders and renovators need convenient access to a wide range of projects to ensure their projects will remain on track. Our knowledge and our attention to detail are well known in the industry. We invest in the success of our customers. Kirsch uses CAFE, considered the top software in the millwork industry. It is an investment we make for our business and our customers. While most of our competitors quote off of Excel spreadsheets, Kirsch has made invested its resources in the most accurate and detailed software for quoting millwork in the industry. The result is more accurate pricing, better service and execution of your project.